Drawing the highest pay in the history of television broadcasting at the time, Barbara Walters became the first woman coanchor of a network evening newscast. She developed to a high art the interviewing of public figures. 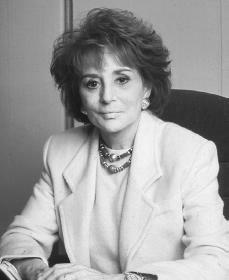 Barbara Walters was born to Dena (Selett) and Lou Walters on September 25, 1931, in Boston, Massachusetts. Her only brother, Burton, had died of pneumonia before Barbara was born, and her sister, Jacqueline, was born mentally handicapped. Her father operated a number of nightclubs, resulting in Barbara attending schools in Boston, New York City, and Miami Beach, Florida. Because of this lifestyle, Walters grew up a lonely and shy child and was especially close to her only playmate and sister, Jacqueline. Walters earned a bachelor's degree in English from Sarah Lawrence College in 1954. After working briefly as a secretary she landed a job with the National Broadcasting Company's (NBC) New York affiliate WRCA-TV where she quickly rose to producer and writer. She also held various writing and public relations jobs, including a stint as a women's program producer at WPIX-TV in New York City. Walters's abilities and experience in research, writing, filming, and editing earned her a job as news and public affairs producer for Columbia Broadcasting System (CBS) television. There she wrote materials for noted personalities who appeared on the CBS morning show that competed with NBC's Today program. She left CBS because she believed further advancement was unlikely. for the Today show. Within three years Walters became an on-camera interviewer and persuaded such notables as Mamie Eisenhower (1896–1979), Anwar Sadat (1918–1981), and H. R. Haldeman (1926–1993) to appear with her. Meanwhile, a number of different "show business" women held the post as the " Today girl," but none had a journalism background. Mainly they engaged in small talk and read commercials. Some at NBC began to think a different kind of woman might help the show. When the spot was unexpectedly opened, Walters was given the " Today girl" slot on a trial basis. The public readily accepted this bright, on-the-air newswoman, who also continued to write and produce much of her own material. A few months later, Hugh Downs (1921–) said Walters was the best thing that had happened to the Today show during his time as host. They would later be teamed on ABC's program 20/20 as competition to CBS's Sixty Minutes. Today featured stories by Walters that included socially significant topics, and frequently she got on-the-spot experience which gave her reports even more credibility. As her reputation grew, NBC made her a radio commentator on Emphasis and Monitor. She also participated in such NBC specials as "The Pill" and "The Sexual Revolution"(1967), and in 1969 she covered the ceremony which conferred Prince Charles (1948–) as the Prince of Wales. Finally in 1974 Walters was named cohost of the Today show. By then, her status as a broadcaster had risen to such heights that she had twice been named to Harper's Bazaar 's list of "100 Women of Accomplishment" (1967 and 1971), Ladies Home Journa l's "75 Most Important Women" (1970), and Time 's "200 Leaders of the Future" (1974). As the most influential woman on television, others soon competed for her talents. In 1976 Walters accepted a million-dollar-a-year contract for five years to move to ABC, where she became television's first network anchorwoman, the most prestigious job in television journalism. She also anchored and produced four prime-time specials and sometimes hosted or appeared on the network's other news and documentary programs. Her contract stirred professional criticism and jealousy. It not only doubled her income from NBC and her syndicated show, Not For Women Only, but it also made her the highest paid newscaster in history at that time. Walter Cronkite (1916–), John Chancellor, and Harry Reasoner then received about four hundred thousand dollars. Despite Walters's sharp, probing interviewing techniques, she seldom seemed to alienate the person she was interviewing. She revealed some of the secrets of her success in her book How to Talk With Practically Anybody About Practically Anything (1970). Others attributed her interviewing success to her amazing ability to ask primarily those questions that the public would want answered. However, Walters still had her critics. Some interview-subjects said her nervousness distracted them. Others claimed she was so eager that disastrous mistakes occurred, citing the instance when she grabbed another network's microphone as she dashed to get a unique interview. Washington press corps members charged that she acted more as a "star" than as a reporter on presidential trips. However, her professional admirers outnumbered those who criticized her. Walter Cronkite noted her special interviewing talents. Sally Quinn, former rival on CBS Morning News, commented how "nice" Walters was to her. Walters's personal life held considerable interest to the public. Her brief marriage to businessman Bob Katz was annulled, or made void; her thirteen-year marriage to Lee Guber, a theatrical producer, ended in divorce. Still they remained friendly, sharing mutual love for their daughter, Jacqueline Dena. In 1985 she married Merv Adelson, who had also previously been wed twice. Walters has had a reputation for often being the first to interview world leaders. During the 1996 presidential campaign she interviewed the first African American Chair of the Joint Chiefs of Staff, General Colin Powell (1937–), after his retirement from the military. She has also had exclusive interviews with both Christopher Darden and Robert Shapiro of the O. J. Simpson murder trial, noted by the media as one of the most controversial murder trials of the twentieth century. Walters also had exclusive interviews with billionaire David Geffen, then with Christopher Reeve (1952–) following the horseback riding fall that left him paralyzed. In 1999, Walters was the first to be granted a public interview by Monica Lewinsky, the former White House intern whose affair with President Bill Clinton (1946–) led to his impeachment trial by the U.S. House of Representatives. Walters's elevation to top-paid broadcaster was credited with raising the status of other women journalists. Her own prowess as a broadcaster exploring socially important issues and as top-notch interviewer were undeniable. In addition, she excelled at bringing to the television public subjects that ranged from show business personalities to heads of state. In September 2000, Walter renewed her contract with ABC. The lucrative deal reportedly pays Walters $12 million per year, making her one of the highest paid news anchors in the world. Malone, Mary. Barbara Walters: TV Superstar. Hillside, NJ: Enslow, 1990. Oppenheimer, Jerry. Barbara Walters: An Unauthorized Biography. New York: St. Martin's Press, 1990. Remstein, Henna. Barbara Walters. Philadelphia: Chelsea House, 1999.